A year into the project, Rotary and World Vision had so far established 31 irrigation projects and 33 seed banks versus goals of 50 each, and work continues. The initial rounds targeted 1,350 smallholder farming families, with 1,375 actually enrolled and work continuing to reach the ultimate goal of 4,000 families. Annual family income was raised from $250 to $1,600 in just the first year, with the final goal of $3,500 appearing to be achievable. 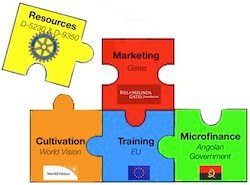 The full, final report submitted to the Rotary Foundation can be downloaded here.